Relics of Fate: A Penny Macey Mystery is a new fresh and polished adventure/hidden object game. You are going to be solving a mystery of some relics and trying to find your dad after he had been kidnapped. The game mingles together all the necessary ingredients to make it a nice game. It is really nice that you often run into different people, and those are animated. The story starts from your visit to your father. You are a young and very attractive woman. She finds out that her father had been kidnapped. He left her a note giving some information about what it can be linked with. The enemies are interested in some relics and while they don't have them, they are interested in her dad, otherwise they wouldn't keep him alive. Penny is now trying to follow all of the clues in search of the relics and her father. So you go to all kinds of places on your way to solve this case. 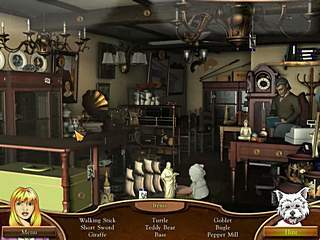 The game offers a balanced blend of the hidden object levels, mini-games, adventure searches, and interaction with the characters. It is really nice that you often run into different people, and those are animated. They move around and talk to you. That's a nice feature. 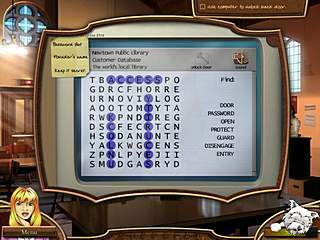 The hidden object levels follow the typical order. You are given a list of items to find with hints available on a rechargable basis. The hints are represented by a small cute dog, that falls asleep when the hint is being recharged. The items are not very easy to find, but at the same time they don't get mixed up with the scene. You will often be asked to find lots of different inventories. Some of them are just to be grabed as you move your cursor across the screen. The others are to be collected in order to make something work. Like you need to get some chocolate, a cap, some water and then you can make hot chocolate for a cop. These items appear in the circles around a magnifying glass. There are also different mini-games, that are made as part of your wanderings and searches. It is pretty cool when all feels like one thing, rather than a collection of different puzzles. The game may not be the best that you've ever seen, but it is worth the attantion. I have already lenread more from your blog than I knew before. i call it a success. And, because I value helping to educate others as well, I've linked to your blog on mine and have awarded you with a Liebster award! Just go and check out my blog and see what that's about! And please, keep up the great information! I might not understand everything, but I sure am enjoying trying to! This is Relics of Fate: A Penny Macey Mystery review. Download this game here.